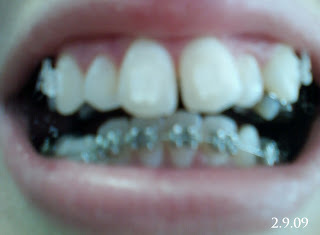 Well I am a day shy of 2 weeks in my expander. 13 turns so far. Over the weekend I had some pain/sensitivity in my right front tooth. It lasted for probably an hour and when I went and looked in the mirror, the tiny sliver of a space that I thought I could see before had turned into a definite space! Woo hoo! Here is a picture of my space!